In the year 2029 mutants are seemingly extinct. Just south of the Mexico-USA border, Logan (Hugh Jackman) – known popularly as the Wolverine – cares for a frail and increasingly senile Charles Xavier (Patrick Stewart). Logan himself has seen much better days. His adamantium claws do not spring from his knuckles so well, and his healing powers seem about ready to fail entirely. When he crosses paths with a young girl (Dafne Keen) on the run from a team of mercenaries, he and Xavier are dragged back into one final battle to keep her safe from harm. Hugh Jackman has been playing the role of Logan for 17 years now, ever since the original X-Men in 2000. As far as I can work out, the only other actor to play a comic book hero for as many years is Patrick Stewart – and he is in this film too. For both men it is extraordinarily likely that this will be their final film in their respective roles, and to the credit of both of them, director James Mangold and 20th Century Fox, their stories end with almost certainly the strongest X-Men film yet made. So good is it, in fact, that personally I would rather the studio end the franchise here and not try and continue it any further. Why spoil a perfect ending? I know that is an unlikely wish – there are at least three more X-Men films already in pre-production – but the bottom line is that few ongoing franchises have ever managed to craft a final chapter that is this perfectly pitched and tonally appropriate. The remaining comic book adaptations coming in 2017, including Wonder Woman, Guardians of the Galaxy, Justice League and Thor: Ragnarok, all have a very high bar to match. A major reason why the film works as well as it does is that it feels like a proper film, and not just an extended series of action beats and visual effects sequences. The screenplay is measured and thoughtful. The photography is atmospheric and effective. In terms of pacing Logan actually takes its time to illuminate moments of character and emotion, and those scenes feel as necessary to the film as any of the more violent parts. It is, it must be said, quite astonishingly violent. For his final appearance Wolverine finally gets the R-rated brutal violence that the character has demanded. Blood is shed in large quantities. Limbs and heads are severed. Claws get stabbed into a lot of fairly graphic places. It is confrontational but appropriate: Logan is a violent person and always has been. This film finally gets to fully express what that violence is like. Hugh Jackman delivers what is arguably the best performance of his career. He gives the character a particular physical cadence. He seems worn out down to the bone, basically a shell of the character that has appeared in all of his previous X-Men and Wolverine films. As viewers we have watched this character for almost two decades, and seeing him in such an exhausted and battered shape is something packs a hell of an emotional punch. It is a similar experience watching Patrick Stewart play Xavier: the character’s mind is slipping and he is susceptible to seizures. As he remains the most powerful psychic on the planet, those seizures are genuinely terrifying events. The film makes it clear that they have produced a body count in the past, and that the US government has classified Xavier’s brain as a weapon of mass destruction. The relationship between Logan and Xavier was one of the strongest elements of the original X-Men back in 2000, and it feels perfect that the actors’ final film in these roles is easily their best. It makes for a hugely emotional experience. 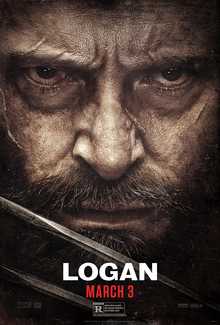 The film’s big surprise is Dafne Keen as Laura, the girl to whom Logan unwillingly finds himself a guardian and protector. It is not giving too much away to reveal that she is herself a mutant; the first Logan and Xavier have seen in many years. The role puts an extraordinary amount of pressure on Keen, having to play a character that was born to be a weapon, is frighteningly violent, traumatised by that violence and – all at the same time – clearly craves a normal life as well. She does an outstanding job, and between her and Jackman there is a stunning emotional connection that builds between the characters as the film goes on. It is a very masculine film, with a predominantly male cast and an awful lot of machismo involved for many of the characters. That is not a criticism by any stretch: it suits the character of Logan perfectly to tell such a story, but viewers seeking something a little less aggressive male may come away wondering what the fuss is about. On a personal level the film hit me hard: I felt a bit choked up somewhere around the halfway mark and never quite recovered by composure. It does a sensational job of hitting a lot of appropriately emotional buttons. Logan draws a lot more inspiration from westerns than from superhero films, and is unashamed and open in doing so. To Mangold’s credit, however, it also ties up very well with the other X-Men films and feels very much part of the some series. In all honesty one could simply watch the original trilogy of films, ignore everything else, and just skip to Logan. It is an utterly superb final chapter. It is, in fact, simply a downright superb film.